Blue Beach public beach lies between Neptune and Sporting beaches and contains the private Blue Beach restaurant. Between Neptune and Blue Beach is the watersports center, Glisse Evasion where you can engage in parasailing, wakeboarding, kayaking, water skiing and more. Even if you don't participate, it gives you something to watch while you're soaking up rays! Another possibility is to sign up for a swimming lesson or aquagym course with the lifeguard at Blue Beach restaurant. Blue beach is across from the four-star Hotel West End and an easy walk from the Hotel Westminister. 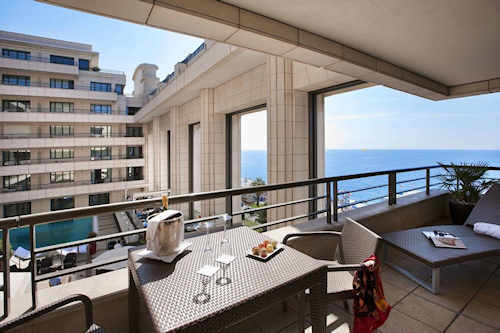 The legendary Negresco and luxurious Palais Mediterranée are also nearby. There's really nowhere to park on the street here; it's best to head further west. There is a paid underground parking garage at the Palais Mediterranée. Although there's no lifeguard on duty at the public beach, you're close to the lifeguard at the private Blue Beach and not far from the lifeguard at the public Lido beach. See more about lifeguards. Blue Beach has all necessary facilities for its clients and there are public toilets accessed from the beach. Besides dining at Blue Beach restaurant, you could cross the Promenade and eat at Koudon restaurant-brasserie. The closest bus stop is Gambetta/Promenade about a block to your west. You'll find buses 8, 11, 52, 59, 60, 70, 94, 98, 200, 230, 400, 500. Blue Beach draws a devoted crowd of locals who appreciate that the restaurant is reliably open all year for lunch. 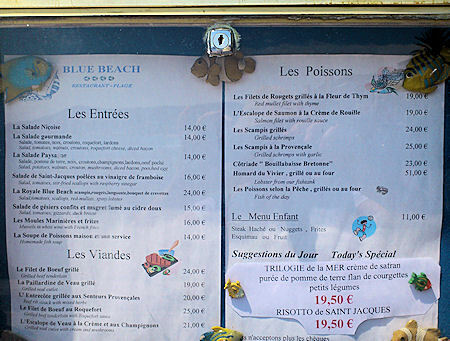 Even in the dead of winter when restaurants up and down the baie des anges are shuttered, you can count on Blue Beach for lunch or an early evening drink. See more about private beaches and beach-restaurants.